To capitalise on World Cup fever and leverage Coca Cola’s partnership status as Fifa partner, psLIVE Spain brought the World Cup to the street using branded metro stations, a ‘footballers’ tunnel’, the sound of a cheering crowd and a live event involving an interactive vending machine which challenged the audience to demonstrate their football skills. For the launch of its special Knacki FootBall – small meat balls that look like footballs – Herta placed a vending machine that offers these meat balls for free. But what people didn’t know, was that they had to play a match against the Belgian football legend, Leo Van Der Elst, inside the vending machine. Discover how people reacted when they found out that they had to play in the world’s smallest football stadium. As part of their World cup activation campaign Budweiser became the first brand to use London’s IMAX as an experiential venue. Inviting 400 trade partners and competition winners to watch the game on Britain’s largest cinema screen, Budweiser created an atmosphere that was as close to being at San Paulo without getting on a plane. After the result most England fans were probably happy that it was only a tube ride home! The IMAX is regarded as a world class venue for brands to make world class statements and is now available as a fully integrated experiential location. The combination of the UK’s number one out of home site, Europe’s largest advertising canvas measuring 1720sqm and the UK’s biggest cinema screen helped make a huge statement to Budweiser customers and a great nights entertainment. The exclusive pouring rights for Budweiser also probably helped ease the pain for the England fans. The campaign was planned and booked through Vizium and Posterscope. For the World Cup, Audi has created a giant scoreboard that will display the results of matches using the headlights of 28 Audi A8 cars. The flagship sedans are stacked together within 45 shipping containers and collectively stand over 40 feet tall, making it visible from not only miles away, but also from airplanes. The installation is on the shores of Greenpoint, Brooklyn, offering a spectacular view to Manhattanites across the river, and will be live through July 14th. 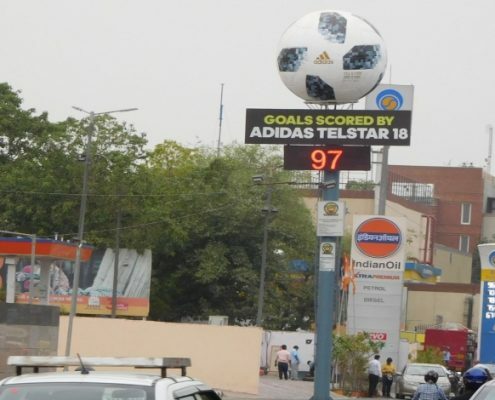 Outdoor Plus has partnered with the Sky Sports reporter Geoff Shreeves to screen his live Twitter predictions for the World Cup across six of its digital sites in London. Shreeves’ match predictions will also appear in Outdoor Plus’ network of digital screens at 16 shopping malls across the UK, including Bluewater. From today Outdoor Plus will screen Shreeves’ tweets across its outdoor sites in London, including at the Euston Road underpass, at Vauxhall Cross interchange and City of London Gateway in Aldgate, during the morning and evening rush hours. Shreeves, a touchline reporter for Sky News, will tweet tips throughout the World Cup tournament to the 274,000 followers of his @Geoffshreeves Twitter handle. 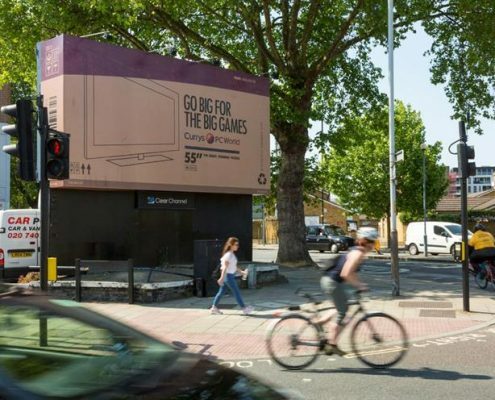 Outdoor Plus hopes the partnership will highlight the way brands can use social media on its digital screens to drive consumer engagement, which it said was vital because 80 per cent of Twitter users tweet while they are out of their homes. 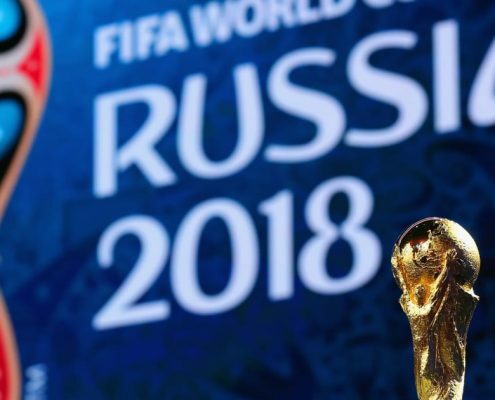 Fifa estimates that around 3.2 billion people will watch at least some part of the World Cup and that the final will have approximately 1.3 billion viewers. Transport for London (Tfl) has partnered with ESPN’s football website, ESPN FC, to deliver football results to London Underground commuters during the World Cup – marking the first time the transport body has signed a commercial partnership. 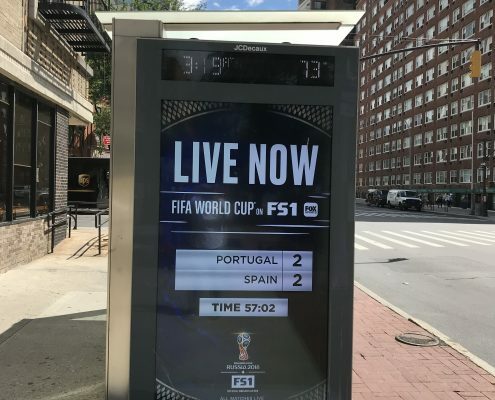 The partnership will see Tfl and ESPN FC bring news, results and score updates from the games to more than 140 stations via overhead platform boards and 400 service update boards displayed at station entrances. As part of the partnership, which launches on 12 June, ESPN FC will run an advertising campaign on the home page and journey planner section of the Tfl website, as well as experiential activity involving football freestylers at Stratford, Charing Cross and Tottenham Court Road stations later this week. As the World Cup in Brazil rapidly approaches, research by work.shop.play., the online urban community, reveals that this year’s event is set to be truly digital. A massive 85% of consumers will be following the tournament online in some form with 41% specifically using social media sites. Mobile also plays a part as more than half of people surveyed (53%) said they will be using their phone to keep informed and 40% will be using their tablet. Brits won’t just be relying on the web for score updates. Almost one in five people (18%) will be using the internet to watch full games while more than a third (34%) will go online to catch up on highlights from the tournament. Following the games online is especially important to the UK’s younger generation – a quarter plan to watch full games online and 22% will watch them on their iPad. Almost half (47%) will log on to view highlights via the web..
Simon Harrington, Marketing Director, Exterion Media commented, “All eyes will be on Brazil this summer, but it’s interesting to see how different our approach will be to following the games compared to 2010. For the first time, internet and mobile are going to play key roles in how we digest news and follow coverage of the games. Crucially, for the Out of Home sector, consumers will be looking to follow the news while on the move. Almost a quarter (25%) say that they plan to follow the competition while on public transport, a statistic which increases to 38% in the 16-34 age group. We expect consumers, and Londoners especially, to make the most of free Wi-Fi on the London Underground to stay connected and share in the excitement the World Cup brings.”. The World Cup takes place in Brazil from 12th June- 13th July 2014 and will be a key event for a range of advertisers, the football enthusiast, and the majority of the nation. Along with the official sponsors and partners, other advertisers can also benefit from one of the world’s major sporting events, and all the excitement and attention that surrounds it. This document details how Out-of-Home, as a broadcast medium, complements World Cup TV coverage, taps into the mood of the nation and social buzz, and capitalises on the change in consumer behaviour associated with the World Cup. Please click here to see the presentation.